Brian E. Small has been a full-time professional bird and nature photographer for more than 20 years. He began birding and photographing from the time he was a small boy with the encouragement of his late father, Dr. Arnold Small. Dr. Small was a renowned college professor, ornithologist and one of the founding fathers and a past president of the American Birding Association. Brian grew up in Los Angeles and graduated from the University of California at Los Angeles in 1982 with a bachelors degree in Geography-Ecosystems. He still lives in the Los Angeles area with his wife Ana, daughter Nicole and son Tyler. bird identification and bird photography. He currently keeps busy working with BirdWatching magazine on a bird identification column he shares with Kenn Kaufman in each issue. Just some of Brian's photo credits include: Time, The New York Times, Audubon, Nature Conservancy, National Wildlife, Wildlife Conservation, Outdoor California, Arizona Wildlife Views, Birding, Birder's World, WildBird, Bird Watcher's Digest, North American Birds, Birders Journal, Western Birds and many more. Kaufman's Birds of North America. 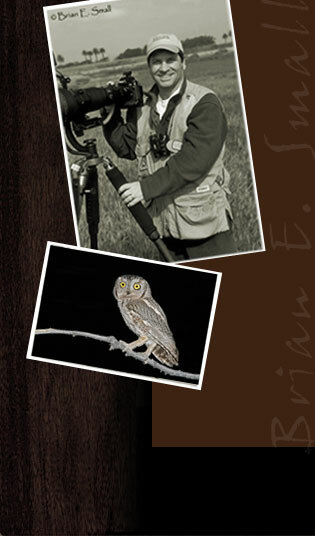 Brian recently completed work with author Paul Sterry and Princeton University Press on his own Eastern and Western photographic field guides to the birds of North America. Many of his images have appeared in Stokes Field Guides, Audubon Field Guides, Peterson Field Guides and National Geographic Books. Publishers Houghton-Mifflin, HarperCollins, Tide-Mark, The National Audubon Society, Academic Press, Cornell University, Princeton University Press, Companion Press, Adventure Publications, Storey Publications, Little Brown and Company, Alfred A. Knopf, The American Birding Association, Dorling-Kindersley Publishing, Stackpole Books and many others have used Brian's work extensively. He is currently working on a series of state bird identification guides for the American Birding Association.